Several oil shale projects around the world are on track to achieve commercial-scale production in the near future, creating a sense of eager anticipation for the industry, attendees heard at the 33rd Oil Shale Symposium, held in mid-October at the Colorado School of Mines in Golden, Colorado. Projects in Estonia, Australia, Brazil and the United States are all close to major milestones that promise to significantly increase the amount of oil that is produced from oil shale, representatives of several companies said. These include Enefit’s new liquid fuels plant in Estonia that is in the latter stages of “hot commissioning,” recently running at 85 percent of its design capacity. David Argyle, who is leading the development of the Irati Energy project in southern Brazil, said that, from a financier’s point of view, one new successful oil shale project will “change the tenor of the sector overnight.” He suggested that development is imminent. In addition to the Enefit280 plant in Estonia, QER’s new pilot plant in Australia and Red Leaf Resource’s project in eastern Utah are due to begin operations in the next year. Enefit’s Utah project is in the environmental review and permitting phase and is several years from starting production. An interesting note about all of the projects that are progressing relatively quickly to production is that they involve surface mining and processing, rather than in situ extraction. Just a week before the Oil Shale Symposium, Royal Dutch Shell announced that it will close its Mahogany Research Project in western Colorado. This follows on Chevron’s closure of its in situ project a year ago. In both cases, the companies said the decisions were part of portfolio-wide reassessments and not a repudiation of oil shale as an energy source. Shell, in fact, said it will continue research in Canada and Jordan and both Shell and Chevron plan to retain their private oil shale holdings in the US. Several other in situ research and development projects are continuing in western Colorado as well. Enefit was asked to host a panel discussion at the 33rd Colorado Oil Shale Symposium about the “social license to operate” – the level of acceptance or approval of an organization’s operations or project by the local community and other stakeholders. The panel highlighted some dos and don’ts and Enefit was extremely appreciative of the positive feedback we received on our transparency and engagement efforts from both community and NGO participants. The oil shale industy has a long, varied and not-always happy relationship with the communities affected by it. As with other industrial ventures today, it has become increasingly difficult for oil shale projects to balance the needs and expectations of government regulators, investors, local officials, environmental watchdogs and residents of areas that host facilities. KSL-TV, the NBC affiliate in Salt Lake City, ran two stories on Enefit’s Utah Project (here and here), based on reporter John Hollenhorst’s visit to Estonia and the Utah Project site earlier this year. In addition, the Deseret News, one of Salt Lake City’s two daily newspapers, editorialized in favor of Enefit being able to move forward with its Utah Project. 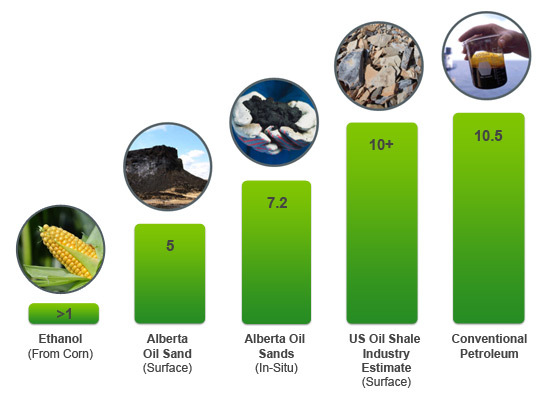 Misconception-busters: Does it take more energy to produce oil from oil shale than it returns? We often hear that producing oil from oil shale is a losing proposition because it requires more energy to create the oil than it returns. Not true. This chart, using data from the U.S. Department of Energy, shows how many units of energy are produced by different energy sources for every one unit of energy invested. As you can see, surface mining and processing of oil shale, as Enefit plans for its Utah Project, is roughly comparable with the energy investment for many types of conventional petroleum production.